Cool! A wonderful book. My favorwrite character was Emilie. This book was recommended to me by a friend and to put it into a few words… I loved it. this electrifying, emotional and thrilling story will be sure to bring tears to your eyes. 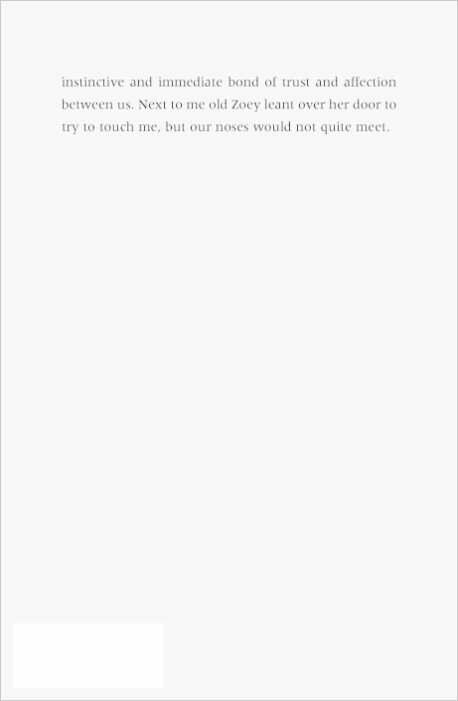 Be ready for twisting pages. 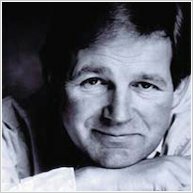 Micheal Morpurgo has added excitement and sadness in every word. 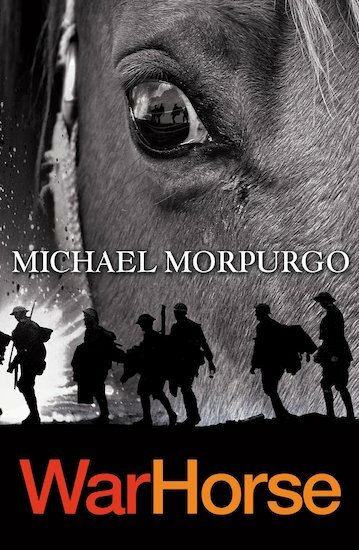 Seeing as the main character and narrator was a horse, this book was quite difficult to relate to and didn’t deal with the horrors of the war very well. I did enjoy some aspects of the novel, but overall it wasn’t for me. This book was recommended to me by a friend and to put it into a few words… I loved it. I thought War Horse was brilliant! It is the most touching book I have ever read, and I would recommend it to anyone, even if they aren’t animal lovers!This book has the most spectacular points of a horses view and it also shows that there is nothing to be scared about horses. Very touching! This book is so realistic and even though I wanted to finish the book and find out what happens at the end, I didn’t want the fantasy to ever end. such a sad book although I really enjoyed it. For me this book was a but too sad, I like a bit of humour but I still enjoyed it! This book is defiantly for older readers as there is a lot of upsetting scenes like horse deaths in battles and horrible deaths etc. this book is probably for 9-100 year olds! A great book about a horse who helps in the war. Would rate 5/5. No words can ever describe this book it’s just too good!! I would recommend it to anyone, everyone!!! The best book of all time!! 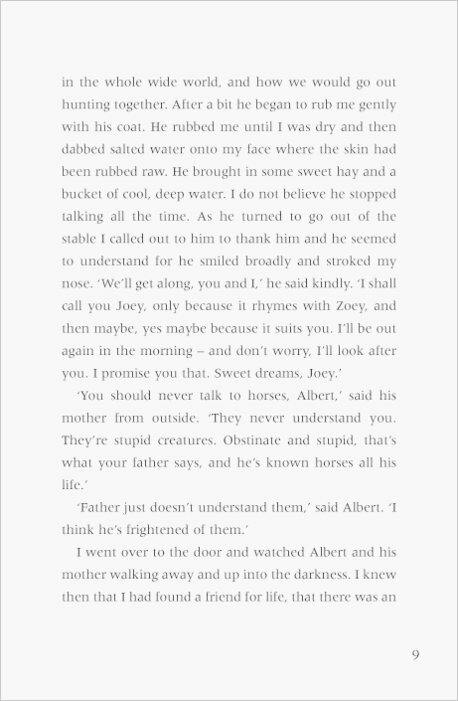 A sad book but its shows who ever you are you can be brave! I would recommend this book to all kinds of people it is a 5 star book!!! great and exiting book, cant wait to read the rest of the collection!!!! I am reading this as a class book at school, we have all just started it!! This book was fantastic! It really made me have a complete different view on horses and what they did! I’ve seen the film so I know what happened in the end but its still a brilliant book. It was quite depressing to me, but i loved it so im going to give 4/5. GO MICHEAL MORPUGO!!!!!!!!!!!!!!!!!!!!!!!!!! 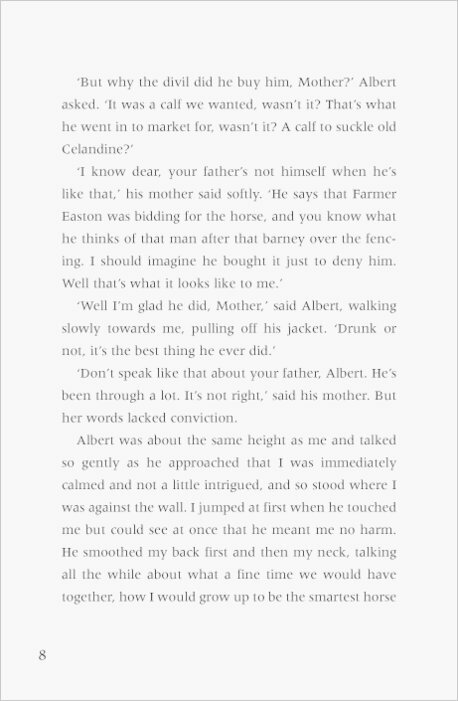 I loved this book i could not put it down it changed the way i thought about the horses in the war. A brilliant book that has been made into a brilliant film. 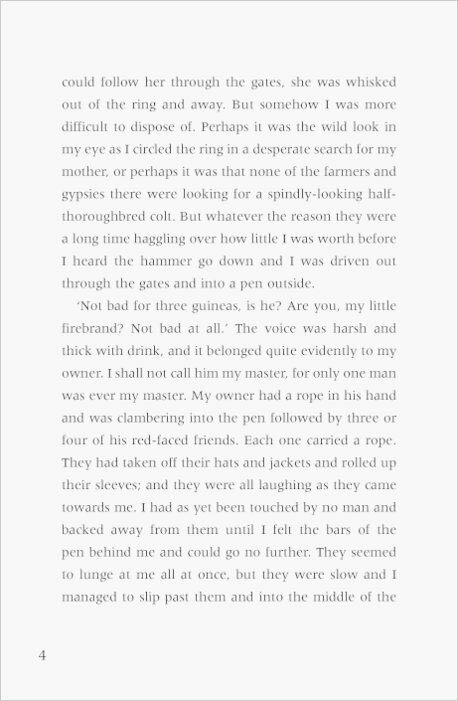 War Horse is not my favorite Morpurgo book. When reading it I almost felt at though the authors heart was not in it when writing, although it has an interesting plot, the story is rushed in places and boring in others. 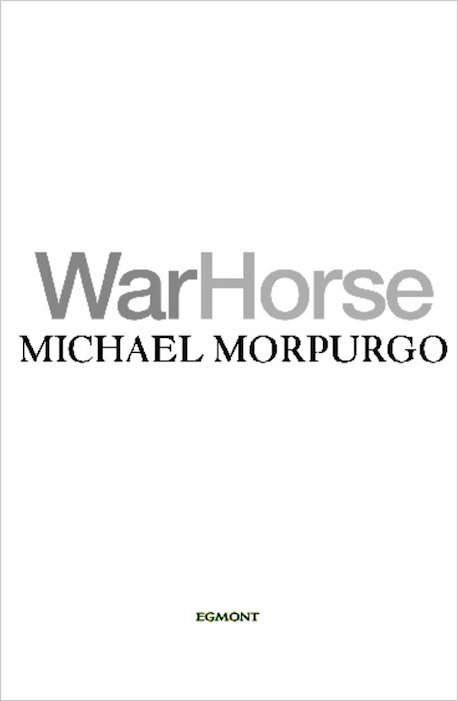 I am a huge Morpurgo fan, but this is not my favorite. 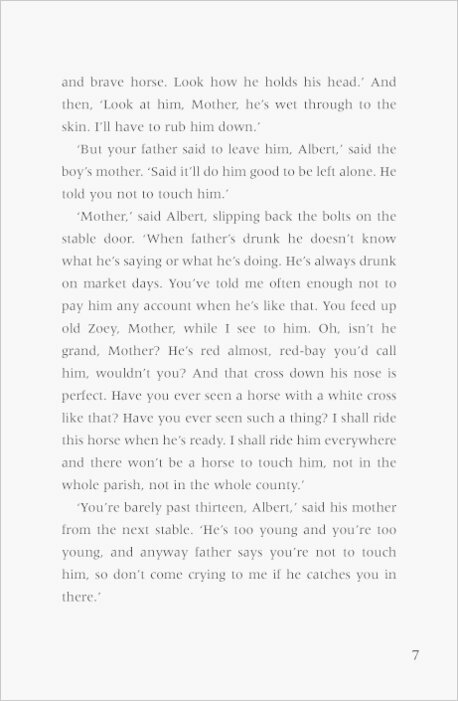 Iread my friends book and its so sad it makes me not want to see horses in war. Made me very upset. I feel sorry for the horse for battling at the front. 3 stars because it’s too sad. 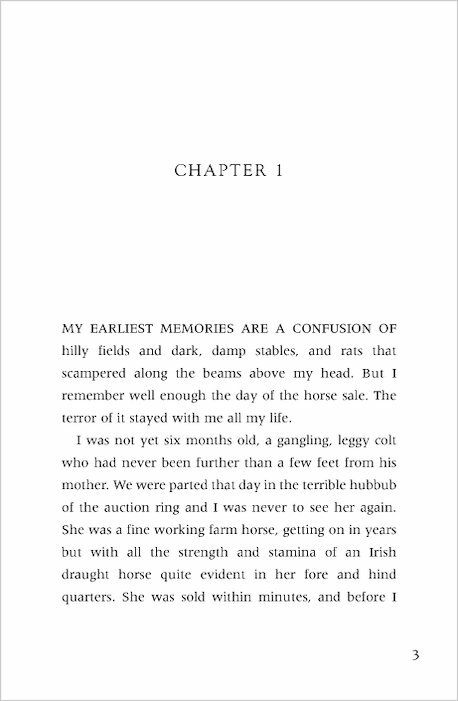 I’m reading war horse at the moment, and so far it’s probably the best book i’ve ever read! But judging by the title, I have a feeling it’s going to be quite sad. this book is super brelliant and intresting out of all the books i read i am going to buy this book and read more its so good its got all the stuff i like. I have not read this book yet but I am getting it. I bet it is good. If it is about war I’m in. I love learnig about.even thoghe it is really bad war. I think this book will get 10/10 for me! This book is sooooooooooooooooooooooooooo good !!!!!!!!!!!!!!!!!!!!!!!!!!! one of my top 5 books really sad and touching.